LGFB is grateful to be selected by Inner Wheel NZ as their chosen charity for their National Service Project from May 2017. The relationship between LGFB and IWNZ inc has been ongoing for many years with support from members and clubs of the organisation across NZ. In May 2017 it was a pleasure to formally acknowledge the relationship by launching the National Project of IWNZinc. IWNZ is part of International Inner Wheel as one of the world's largest Women's Service organisations. There are 5 districts with a number of clubs and nearly 2000 members throughout NZ. 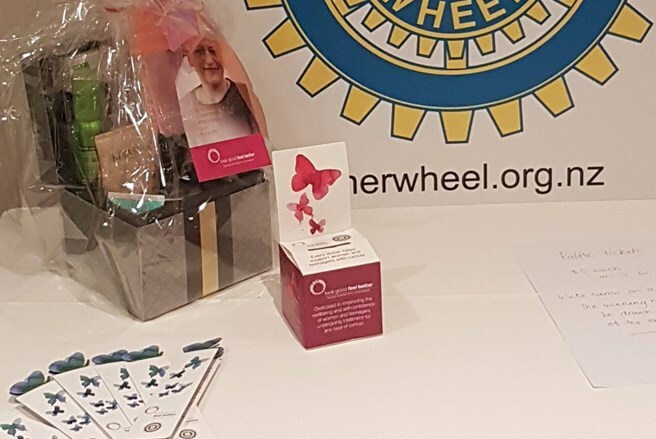 The relationship encourages Inner Wheel members and clubs to be involved as volunteers and to assist with fundraising to help LGFB classes run Feel Better Classes in local communities across the country. Many clubs are assisting our classes by providing morning teas and volunteers at Feel Better Classes. We are delighted to be in relationship with IWNZ inc and look forward to sharing opportunities with clubs in the future. Supporting Women to Glow Trilogy has partnered with female graffiti artist ADORE, to bring a ‘Glowing Lady’ portrait to life over a week period, on Ponsonby Road in Auckland, from April 1st – 7th. We are taking a 40ft container that can only be described as having lived a hard life. We will transform the container into a fully consented habitable multiuse space for its next leg of life. Thank You Inner Wheel New Zealand for your outstanding effort over the last year to donate over $27,000 to Look Good Feel Better. Over 250 free Feel Better Classes in local Communities across NZ. Open to anyone undergoing treatment for any cancer.